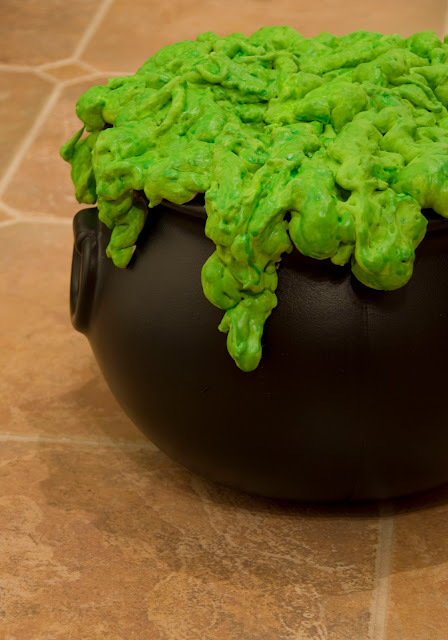 Yet another easy/cheap/fun Halloween project to make. Kids can help with this one too! 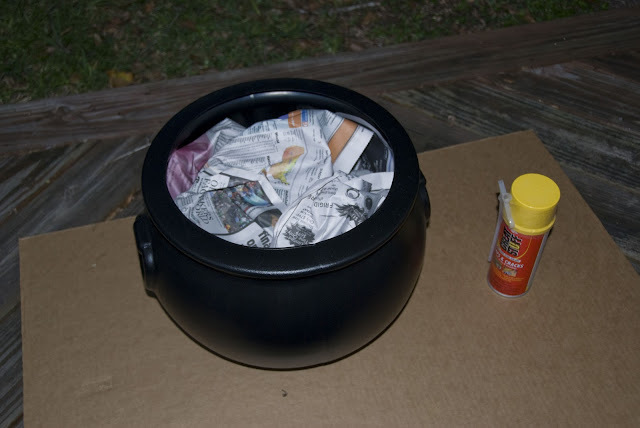 Crumple up some sheets of newspaper and stuff into the bottom of your cauldron. As you can see below, I stuffed it nearly to the top. Then just spray the foam around in different bursts so that it covers the paper and has some texture by giving it that bubbly look. I don't quite know how to explain this part in writing... hopefully you get the idea. I found out the hard way that this project takes more than one can of foam. A smaller cauldron would probably only use 1 can. 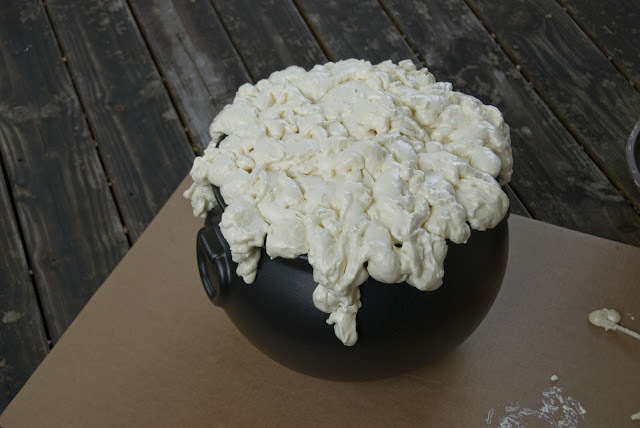 This is what it looked like after only one can of the foam! Not quite what I was envisioning. Day 2. Ah, that's better - one more can did the trick. Just the right amount of bubbling ooziness. Make sure you spray some over the edges so that it has that 'dripping' effect. Next just paint it green! I used two different shades of green. The second (darker) green supposedly glows in the dark. We shall see. Here's where the kids come in. My 4-year-old loved painting it and picking out the eyeballs and bugs to decorate it with! No gross additions are shown here because I plan on using it for my work Halloween decor sans bugs. But can't you just see some lovely worms, roaches, eyeballs, etc. laying on top? Oh my gosh! That is so awesome!!! So darn clever! What a great idea! I just bought a cauldron too... I found you on Sew Woodsy link up party. This is a really cool idea-I'm going to have to remember this for next year~! What a fun idea! I am sure you are going to have some fun with that! 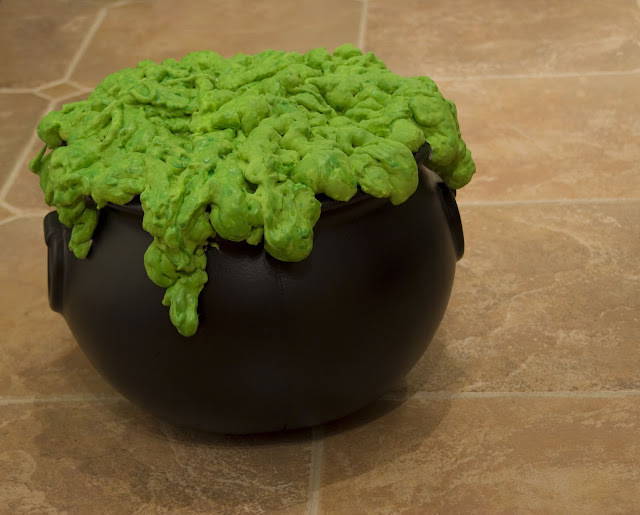 How did you get the paint to stay on the foam and off the cauldron? spray paint or acrylic? I love it-I am so doing this! I used acrylic paint. Gave my daughter a little foam brush and let her go to town on the top. I handled the edges with a small bristle brush very carefully! This is so cool! 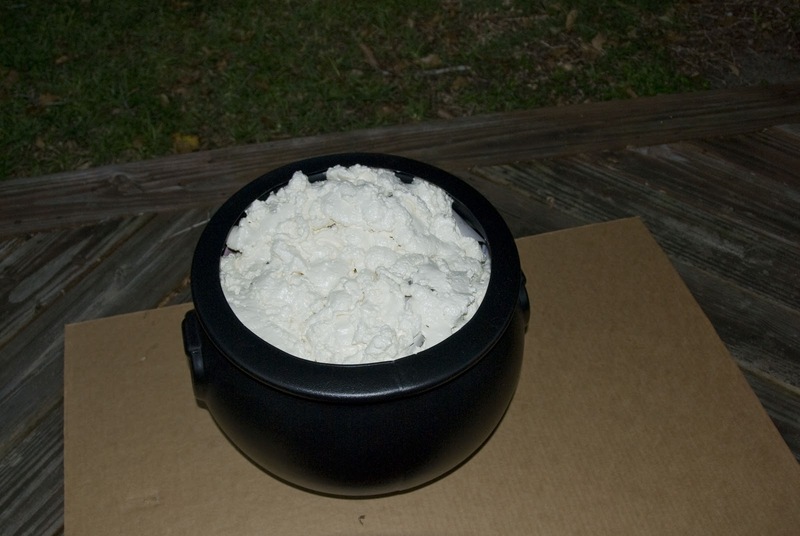 We have some cauldrons too so maybe I'll do this one last project. I keep saying that! Great job! I'm your newest follower! BTW...is it weird that this makes me hungry for green apple airhead? You know the candy? LOL! This is so darn cute! I made a scrapbook recipe book a couple of years ago with a cauldron as the main part for October. I put glitter on top of my green goo. Thanks for idea. I did this and glued bugs to it. I also put a sign next to the cauldron that read "One treat per child please." It was our trick on the kiddies!